It’s National Cordon Bleu day, in these United States. Totemic exemplars of existential horror are everywhere you look in the Newtown Pentacle. To wit, at the border of Sunnyside and Blissville, you’ll find the Long Island Expressway, which was sited along it back in the 1930’s. Pictured above is the overpass which carries Greenpoint Avenue across the expressway, where a “ghost bike” has been encountered for several years. 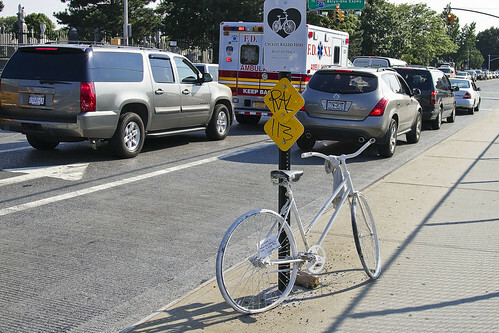 Ghost Bikes, for those of you not in the know, signify the spot where a bicyclist died after being struck by a motor vehicle. 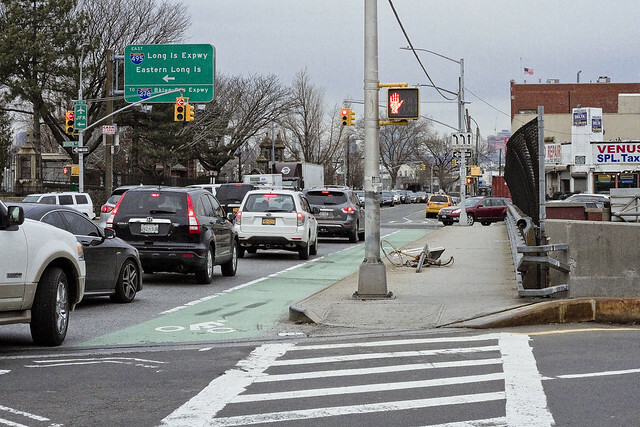 Post facto the installation of this Ghost Bike, the NYC DOT has since installed a bicycle lane, which is a badly placed one given that heavy trucks and thousands of automobiles routinely execute turns on this traffic choked overpass. 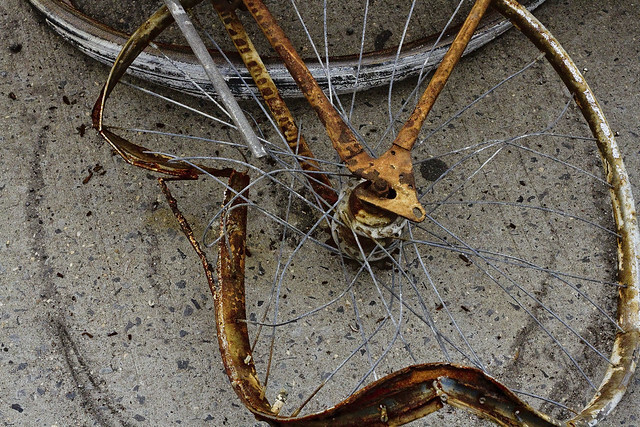 The ghost bike, as originally encountered a few years ago, and before the bike lane was striped in. Walking over to Greenpoint from Astoria the other night, for a meeting between the DEP and the Newtown Creek Monitoring Committee, the scenario above was witnessed. 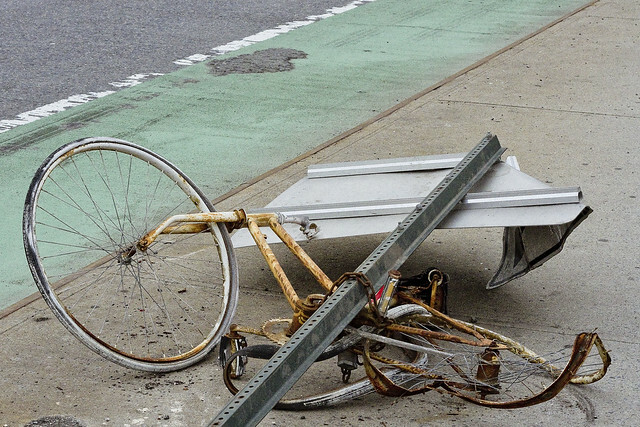 It appeared that a vehicle of some sort had taken out not just the ghost bike, but had also snapped the steel signpost it was affixed to. The thing I’d like to point out is that the driver of this vehicle had to have been “busting a move” through the bike lane, which proves a point I’ve been talking about for awhile. You’re not even safe on the freaking sidewalk. Bike lanes area a fairly decisive issue amongst some Queensicans. More often than not, the argument against these things involves people protecting their street parking or something. I see bicyclists completely ignoring the street markings for these bike lanes and doing whatever the hell they want to – sidewalks, wrong way, running lights, all kinds of stuff. Everybody has probably ridden a bike at one time or another, everyone has also done something stupid on their bikes – that’s not the point. I see some truly tragic implementations of this bike lane thing, which were clearly drawn out in an ideological fashion by people who are staring at maps of remote places they’ve never visited. The bike lanes on, and leading to, the Greenpoint Avenue Bridge are ludicrous and actually cause a constant traffic jam mid bridge – it was and is far safer for the bikes to ride on the sidewalk of the bridge than to try and navigate the gravel and debris which litters the GP Ave. Bridge lanes. The ones here at Greenpoint Avenue and the LIE are also a disaster. Again, it’s better for – and is the observed custom of – bicyclists to use the sidewalk to cross the overpass. That’s what 5:41 p.m. looks like on a weekday at this intersection. 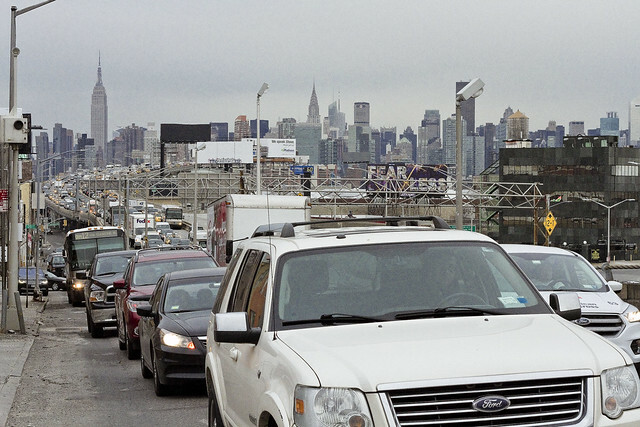 That white SUV in the foreground is the head of a vehicular snake of east bound stop and go traffic which coils all the way back to Midtown Manhattan. It’s so busy that NYPD has permanently stationed traffic control officers here during the rush hours. If there has to be a bike lane on Greenpoint Avenue, lets widen the sidewalk and line it with those concrete jersey barriers to protect both scuttling narrator and the riders of those mechanical contraptions called bicycles. That would be smart. 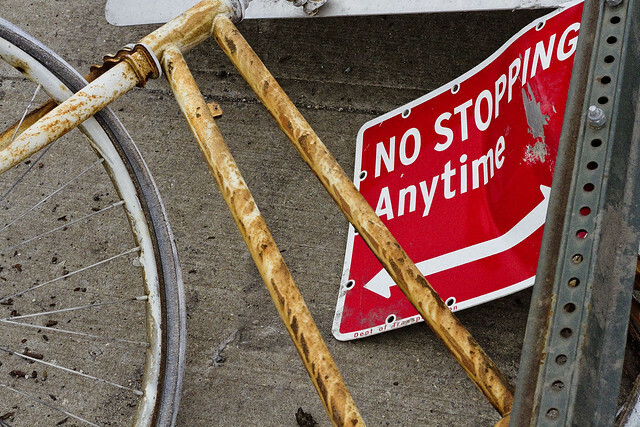 If this spot can kill a ghost bike… the mind boggles over the implications for one such as myself.